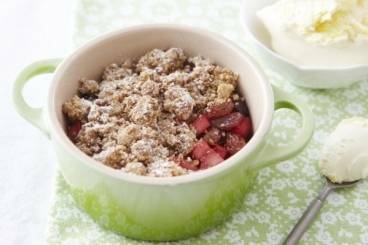 A warming fruit crumble made with apples and blackberries served with thick clotted cream. Peel and dice the bramley apples. Mix with the caster sugar, cinnamon and raisins. Add the blackberries and then place in a roasting dish. For the crumble: Dice the butter and keep it cold. Rub together the butter and the flour until you have a breadcrumb consistency. Stir in the Demerara sugar and the oats. Cover the fruit with a generous layer of the crumble and then bake in the oven for 45 minutes to 1 hour until the crumble is golden brown. Allow to cool slightly before serving in a bowl with a generous dollop of clotted cream.